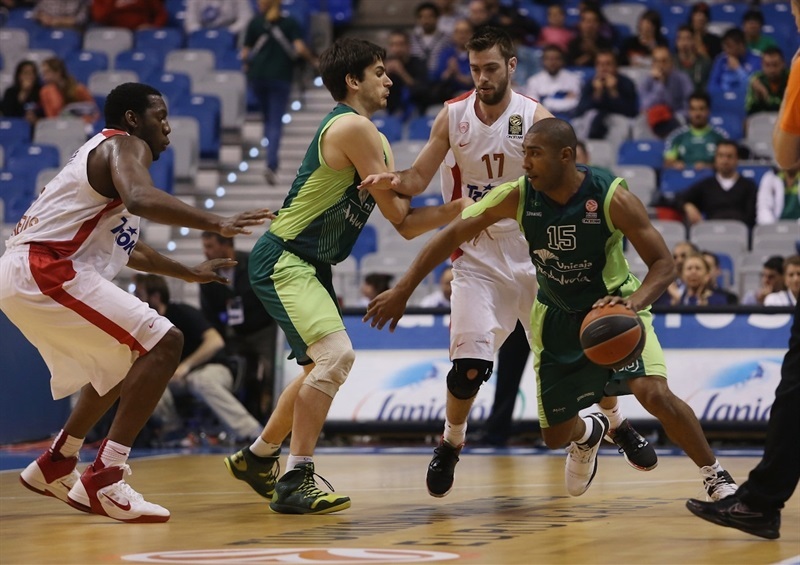 With spots in Euroleague playoffs at stake, reigning two-time champion Olympiacos Piraeus never trailed on the road, handling Unicaja Malaga 63-80 in the Game of the Week on Thursday at Martin Carpena Arena. Olympiacos improved to 6-6 and at least a share of fourth place in Group E, while Unicaja dropped to 5-7 and sits in sixth place. The Reds took control and built big leads from the get-go, hitting 4 triples and building an early 5-20 advantage. Unicaja made runs, but never got closer than 5 point the rest of the way. After leading 34-41 at halftime, Olympiacos was quick to regain a double-digit cushion and increased it to 59-80 before the game was over. Vassilis Spanoulis and Matt Lojeski paced the winners, with reigning MVP Spanoulis hitting 4 triples and scoring 20 points, while Lojeski netted 18. 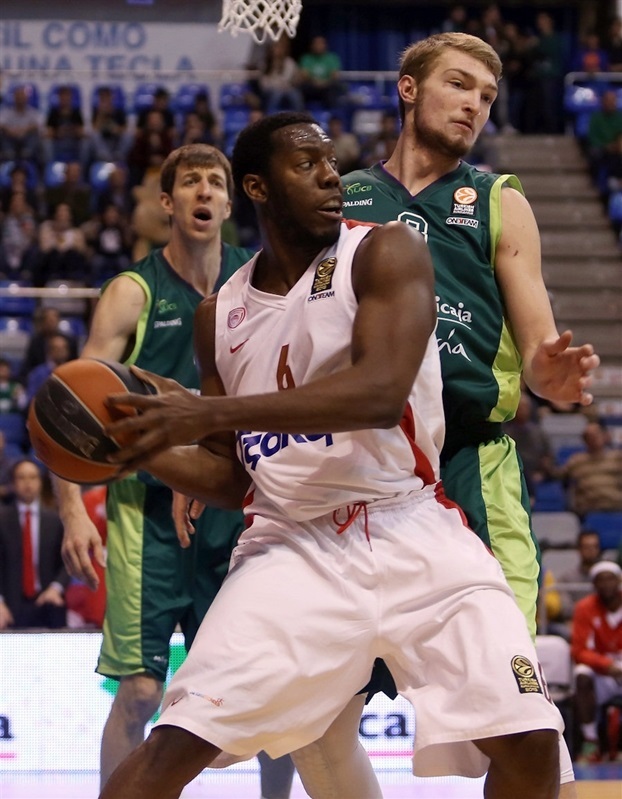 Brent Petway scored 9, while Evangelos Mantzaris dished 9 assists and grabbed 5 rebounds for the visitors. 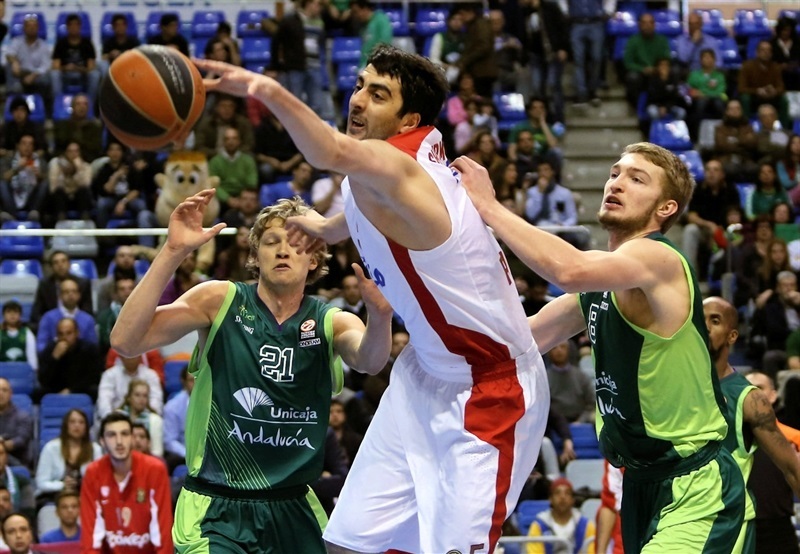 Txemi Urtasun bagged 13 points for Unicaja, and Zoran Dragic and Vladimir Stimac had 10 apiece in defeat. Giorgi Shermadini started things with a pair of free throws for the visitors, and Fran Vazquez made a huge dunk in the lane to open the account for Unicaja. 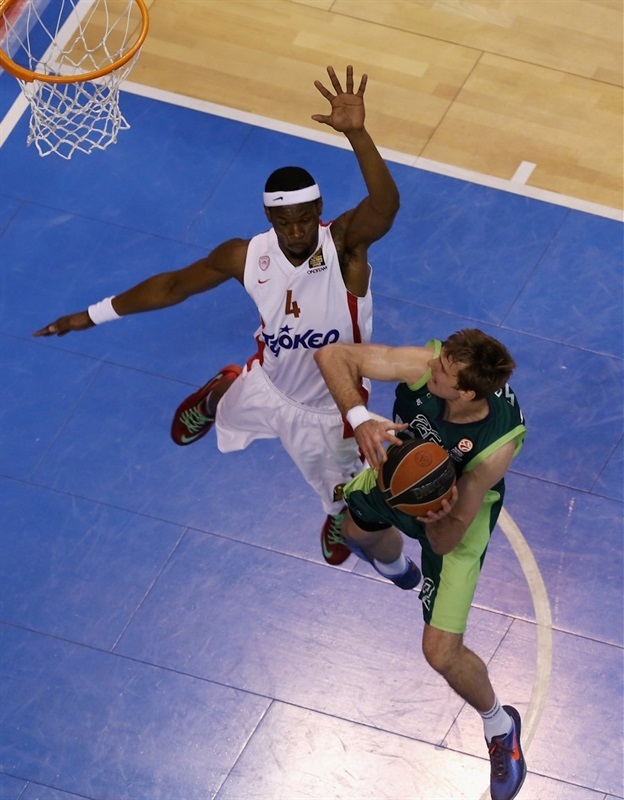 But Shermadini scored a layup, before back-to-back three-pointers from Ioannis Papapetrou and Spanoulis made it 2-10. Bryant Dunston's steal led to a Shermadini dunk on a breakaway, making it a 10-point affair. After a timeout by home coach Joan Plaza, Carlos Suarez hit his first three-pointer, but Dunston had a monster dunk, before Lojeski hit a three-pointer from the left corner and Spanoulis followed it with one from the right corner to make it 5-20. 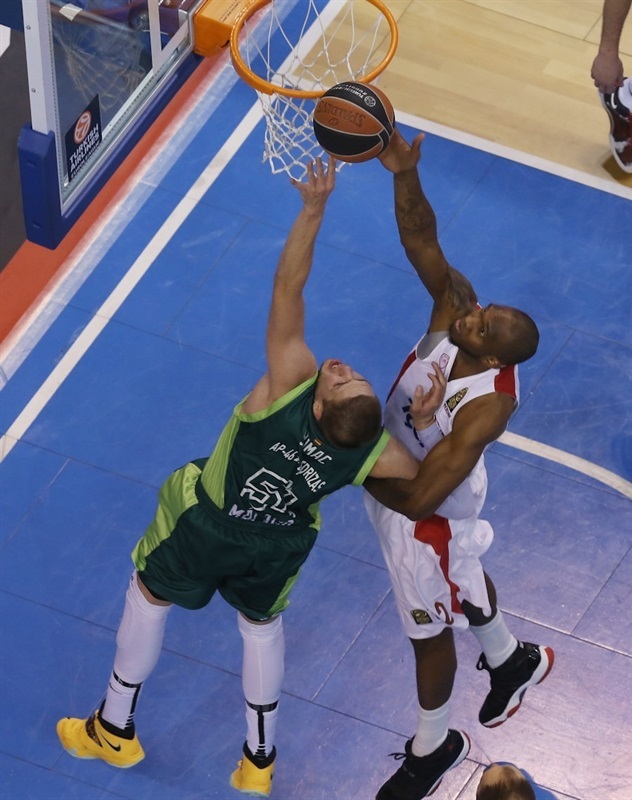 Zoran Dragic nailed another triple for Unicaja, and Spanoulis banked in a short jumper on the other end, but the hosts cut the deficit with tip-ins from Stimac and Jayson Granger, before a triple from Urtasun got them to 16-24. Lojeski added a layup to the Reds' tally, and after Ryan Toolson made a floater, Vasileios Kavvadas ended the first quarter with a layup and an 18-28 scoreline. 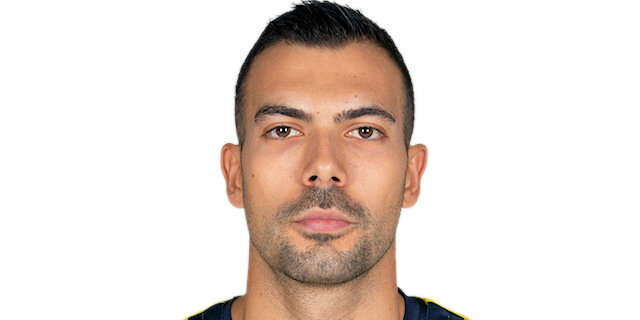 The two teams traded close range baskets early in the second, with Lojeski and Kostas Sloukas scoring for the visitors, while Urtasun and Stimac made baskets for the hosts. A corner triple from Suarez cut it to 25-32, and after Lojeski drove the baseline for a big dunk, a jumper from Urtasun and a layup from Stimac got Unicaja within 29-34. Dunston scored a reverse layup, and Sloukas buried a corner triple for a 30-39 lead. Vazquez and Dragic cut the deficit once again, scoring from close range, before Brent Petway rounded out the scoring with a tip-in for a 34-41 halftime lead. 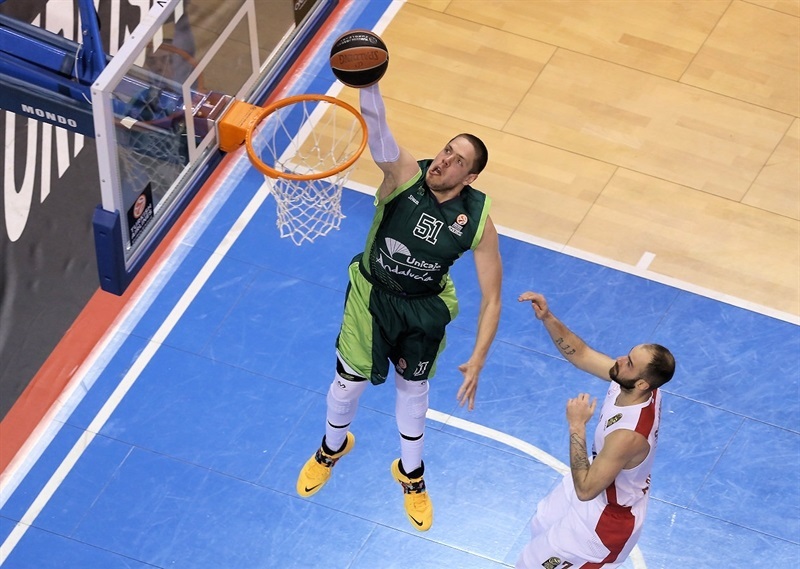 A fastbreak dunk from Stimac got Unicaja rolling in the third quarter, but a pair of Olympiacos steals led to consecutive fast breaks, as Spanoulis, Mantzaris and Lojeski made it 36-47. 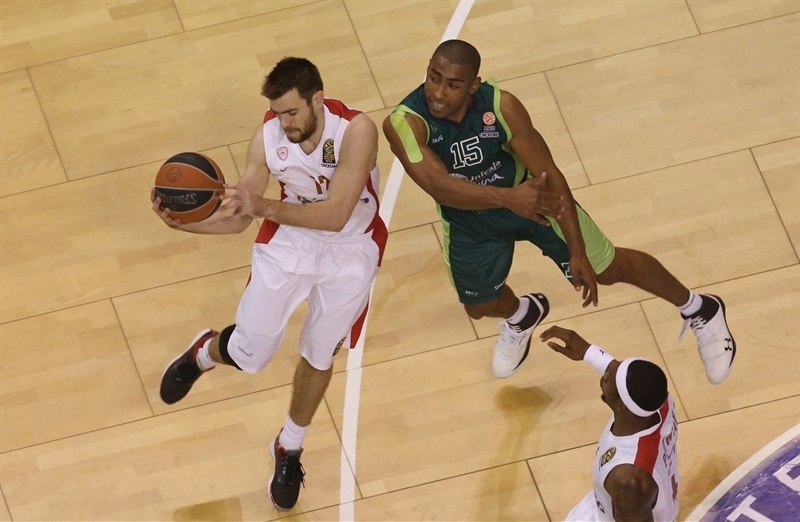 Petway and Dragic traded three-pointers, before Spanoulis and Dragic traded quick layups. Lojeski sank a baseline jumper to make it 43-54, and with the offense running through Mantzaris, the margin went to 15 points with a tip-in from Petway and an easy layup from Lojeski. 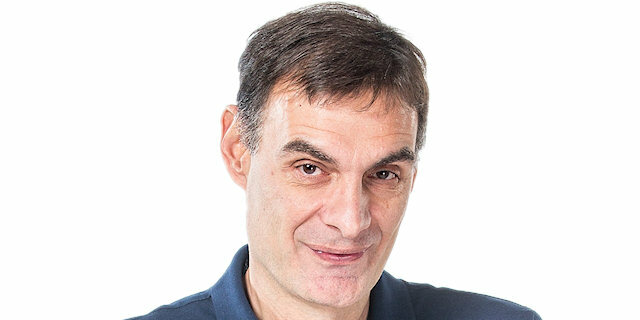 Urtasun scored 3 of 4 from the charity stripe, as Unicaja tried a zone defense which kept the visitors scoreless for two minutes before a layup from Cedric Simmons. After Toolson hit a long jumper, and Suarez made 2 free throws, Spanoulis knocked down a triple in the closing seconds of the third quarter for a 50-63 lead. 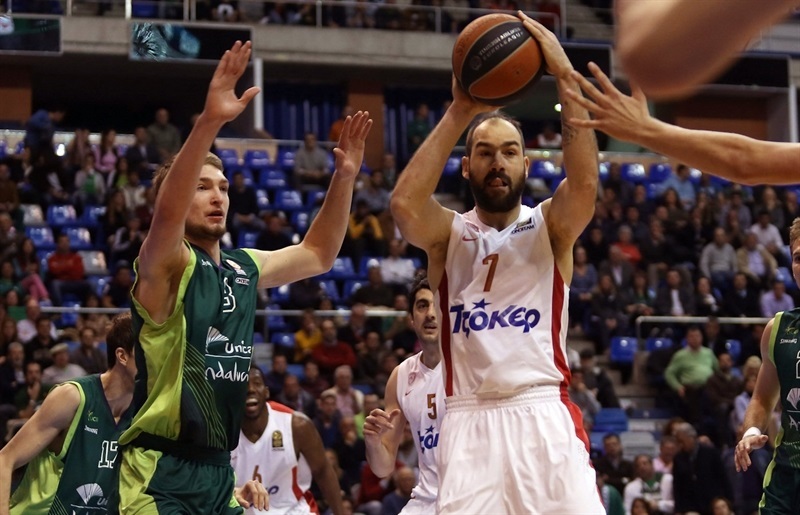 Urtasun sank a second chance three-pointer at the start of the fourth, but Spanoulis returned the favor from deep. Lojeski added another jumper to the tally, as the nerves started getting to the hosts. Vazquez made a dunk, and Mindaugas Kuzminskas had a layup, but Dunston made 3 of 4 from the line, before Papapetrou hit a triple and drove for a layup, making it 59-78. Petway scored on a fastbreak to break the 20-point barrier, before the hosts cut the final margin with free throws in the last minute of the game. "They were better. The physical level in the game was very good and we could not match it. Our beginning of the game was bad and we had to fight the scoreboard throughout the game. I have no complaints to my team because they wanted to do well and had a good attitude. Having reached the final three games with options to get into the playoffs I think is very good despite all the difficulties that we are having. We are competing against important teams like Fenerbahce and Olympiacos to qualify for the playoffs." "We played very well tonight. From the beginning we were very intense and very focused. 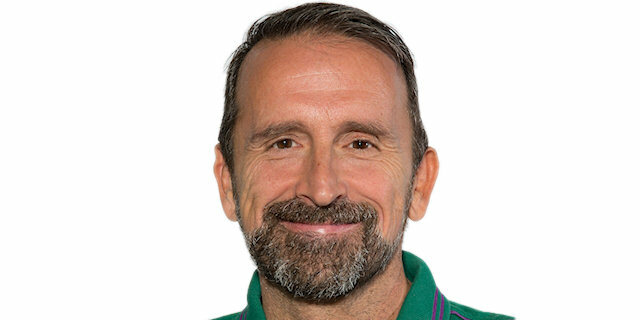 Playing in Malaga is always very difficult because they press well and the atmosphere in the court helps them. We controlled the game from defense. We defended very well for 35 minutes and changed the defense near the end to stop the pick and roll. Our guards had a great game. They have learned how to play each game situation and I think is one of the most important things in this game. With this victory we are closer to qualifying, but we still have two tough games." 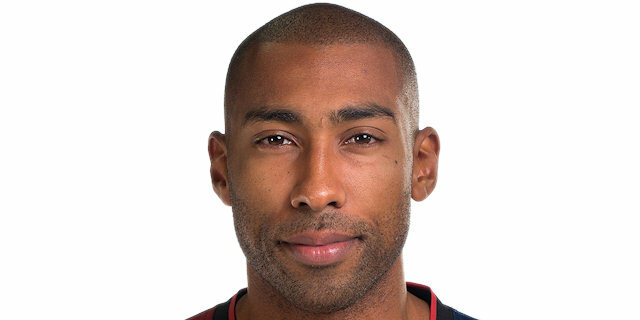 "We played a very difficult game tonight. From the start things got complicated because they took the lead and that was key to the victory. From that moment we try to reduce the lead, but Olympiacos defended very well and did not let us score easily. After the break the team came out with great force, but they played very quiet and did not allow us to get baskets. They knew how to play the score and although we made a great effort, we did not manage to win. We have two very difficult games and we still have options to get into the playoffs." "We are very happy for this victory. The win here in Malaga allows us to step forward to qualifying for the playoffs. 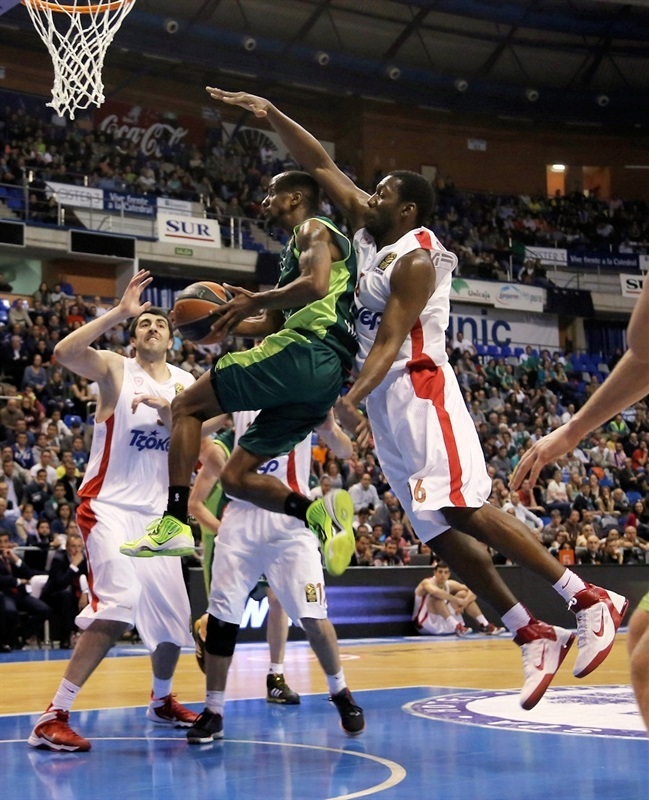 Unicaja was a direct rival in the group. From the start we dominated the scoreboard. We started the game very focused and defending very well. That defense allowed us to achieve a significant difference in the scoreboard. They did not give up and slowly reduced the difference, but we worked very well at this time and took the victory. Now there are a couple of very important games and we have to keep working hard to reach the playoffs."